To house the brickworks' employees, a 'model' village was constructed alongside. It was named Stewartby in honour of LBC boss Halley Stewart, who sought to provide optimal accommodation for his 2000 workers. Its handful of streets wound round crescents and triangular greens, in an attractive suburban manner. The houses were built from brick, naturally, in large semi-detached pairs with spacious gardens. They're still there, still part of a rather special community, although with residents now sorely lacking in employment options. At the heart of Stewartby village is a community hall in a colonial style, complete with clocktower and cupola. In its day the hall would have hosted dances and concerts, whereas yesterday the highlight was a Christmas Fayre and the switching on of a few icicle lights. The building is set on a central axis, aligned via two mini-roundabouts to the main entrance to the brickworks. 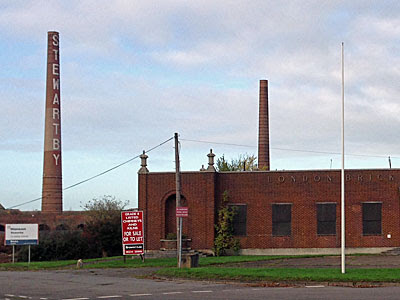 One long brick wall remains, with a central doorway leading nowhere much, and three forlorn flagpoles out front flying nothing. 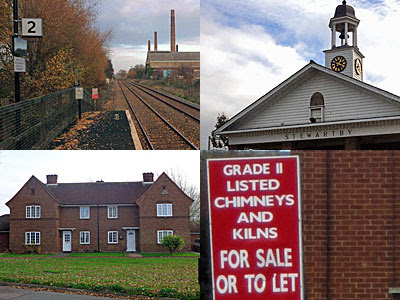 Beyond is an expanse of empty space and empty buildings, leading eventually to low arched brick kilns spreading out from the base of the surviving chimneys. Bedfordshire Council have plans for an industrial/residential renaissance, as yet unfulfilled, and somewhat at odds with the garden village alongside. 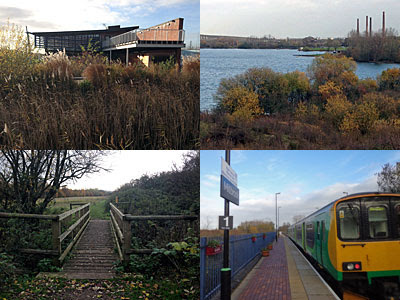 The surrounding area, between Bedford and the M1, is home to the Forest of Marston Vale. This is a major environmental feature, created in partnership with the Countryside Agency and the Forestry Commission, which aims to develop several dozen square miles of woodland over the next couple of decades. And at the heart of the developing forest is the Millennium Country Park, a wetland zone based around a number of flooded clay pits. The largest of these is Stewartby Lake, home to an impressive-looking sailing club, and with a three mile path around its perimeter. The other half of the park is greener, and marshier, with a sealed off central nature reserve. It's rather quiet over here, as soon as you step away from the car park, because all the action takes place within the central Visitor Centre. This is a spacious two-storey wood-framed building, complete with gift shop and a rather impressive cafe. Any remote facility that can attract several dozen visitors in late November is doing well, and I suspect the food offering (toasted sandwiches, yum) is responsible. But it would be a shame to get this far and not head out for a stroll, or a circuit, or a 20-step climb up to the central viewpoint. And you can get here, if you want to visit, via the Marston Vale rail line. This backwater branch runs between Bedford and Bletchley, with one- or two-carriage trains rattling back and forth roughly hourly. The service isn't what commuters in the southeast are used to, but provides a lifeline for a string of communities nonetheless, and seemed relatively busy yesterday. Stewartby station is three stops from the northern end, and Millbrook one stop further down, with the Millennium Country Park linking the two. The latter sits at a bleak crossroads close to the Millbrook Vehicle Testing Centre, a large site with a swirl of circuits where all kinds of road transport is taken for a spin. But you won't see much, it's a private site, so a wetland walk to the brickworks makes a much more tempting proposition.